A year after renovations at two Hartford golf courses, there are mixed financial results. 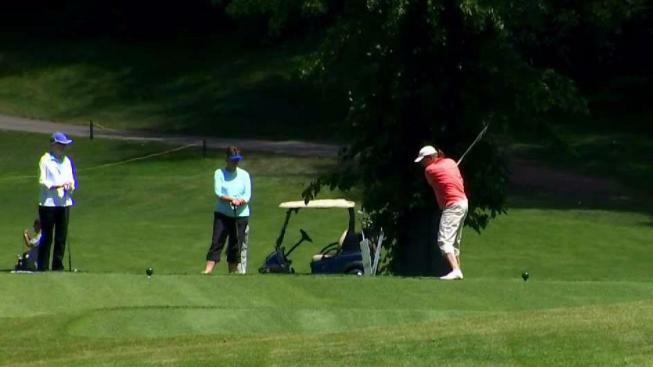 A multi-million dollar renovations to two Hartford-run golf courses, the city says one of them is exceeding financial projections while the other is in the red, as expected. The city admits though, that usage at Keney Golf Course and Goodwin Golf course fell short of projections for their first year. Hartford’s Keney Golf Course has a lot going for it, including a renovated clubhouse. The Goodwin Golf Course on the other side of the city just received approval for some major improvements after investing $1 million dollars over the past three years. To make the golf courses profitable, the city will also need to charge more and have more golfers from out of town. Many call it nothing short of a miracle that the team overhauling Keney and Goodwin golf courses were able to transform long-neglected greens and fairways. In fact, Golfweek recently named Keney the third best public golf course in Connecticut. Whether or not Hartford’s $11 million dollar investment will put city golf on a course to profitability remains less certain. In the first year since the makeovers, the historic Keney Golf Course outperformed financial projections and broke even. Goodwin was $200,000 in the red, as projected. However, both courses fell short on the projected number of rounds played. Keney fell short by about 500 rounds and Goodwin by 1500 rounds. “It was our first effort at projecting usage at two golf courses. As you know we basically inherited two broken golf courses that we had to reconstruct from scratch and that included rebuilding the membership base,” Tom Baptist, Hartford Superintendent of Public Works, said. The city projects both courses will almost break even this year. Baptist and his team have lowered estimates for the number of rounds played and raised greens fees by $1 to $4 per round to make up for that. He does not expect another rate change any time soon, and says Hartford’s greens fees are comparable with other municipal courses. Also noteworthy are the revisions on who Hartford expects will use its courses. Goodwin should remain dominated by locals, but at Keney, projections now indicate a majority of the golfers will come from outside Hartford. “I think it recognizes the fact that Keney Golf Course has a regional draw. It’s that spectacular a golf course,” Baptist said. As part of the improvements approved for Goodwin is a new clubhouse. Council members also have approved a new $2 million irrigation system to replace one that the city says is barely operating, and wasting water and money.